I put together this list of printables for organizing home life because I’m old school and work better with pen and paper. Seeing what I need to do laid out on a piece of paper does wonders to help me get things together. Our homes see a lot in a single day. Between cooking meals, managing a household, and paying bills, there’s a lot to remember. I create printables all the time to help with different aspects of family life. I also sell family binder printables to help you organize every area of your life. I’m not the only blogger who creates printables though. 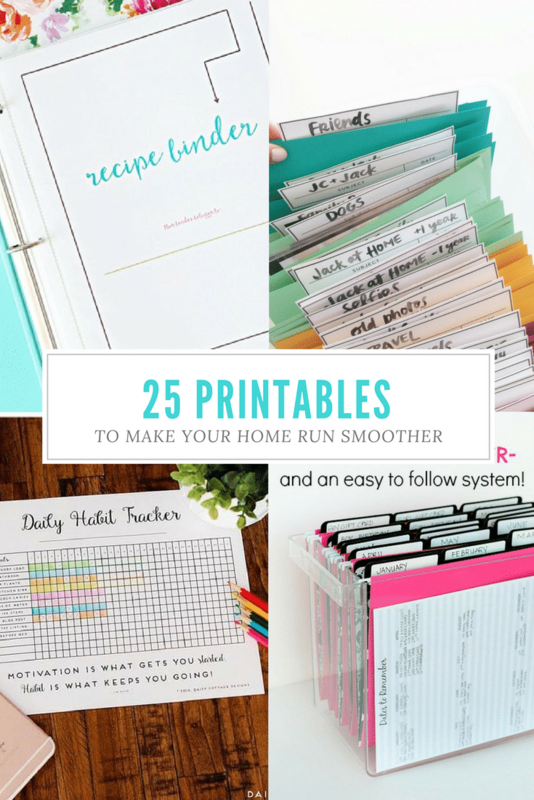 So, today I’m sharing a bunch of free printables others have created to help make your home run smoother than it’s ever run before! These printables will help you get your life under control and keep you organized. And did I mention that each of the printables for organizing home life in the lists below are FREE? I’ve organized these printables into categories to make it easier to find exactly what you’re looking for. Whether you want to run your entire household with the help of checklists and forms or just want some cute spice jar labels, you’ll find what you need below. Need to keep track of your family’s busy schedule? Frustrated that you can’t easily find a family photo to send in for a school project? Getting ready for a move? One of the hardest parts of staying on top of busy family life is keeping track of all the important information! These printables will make it easy to remember everything from passwords to prescription medication. Keeping our families nourished is an exhausting job. These printables make this chore a little more fun. It’s really important for moms to take care of themselves in order to be able to care for their families. These printables will help you practice good habits and reach your personal goals. When we don’t have our household finances under control, home life can start to fall apart. These finance printables will help you avoid financial strain. Along with cooking, cleaning is one of those mom chores that we simply must get done. These cleaning printables will help make that job a little easier. There you have it! Over 25 free printables for organizing home life. Didn’t find what you were looking for? Check out the family binder set below or leave me a comment. Your suggestion might just be my next free printable! If you really like using printables and want to get everything you need in one download, check out my Ultimate Family Binder Printable Set. It has over 100 pages of printables to help you manage EVERY aspect of home life. This is a great post Corinne! I am not an organized person and I need all the help I can get.